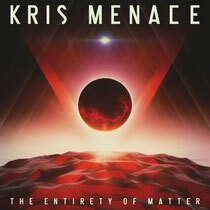 One year after MTV presented Kris Menace’s collaborative album ‘Features’, he returns with quite possibly his most stunning body of work yet – ‘The Entirety Of Matter’. Upon first listen the sheer emotion ploughed into Kris’ futuristic synth-scapes is omnipresent. Joining the dots between melancholy and joy to tranquility and agitation, every track oozes with a passion, highlighting Kris’ ability to capture raw feelings and turn them into empathic musical pieces that tug hard on the heartstrings. ‘The Entirety Of Matter’ comprises of 12 instrumental tracks, each one with its very own futuristic gif animation designed by Mr Div aka Matt Divito, a Boston (USA) based motion graphic designer. Wow, awesome blog format! How lengthy have you ever been running a blog for? you make running a blog look easy. The total glance of your site is excellent, let alone the content material!